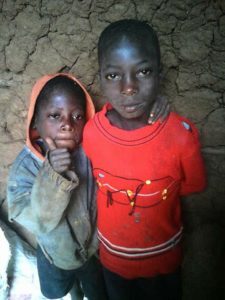 Meet two of our new orphans, Robert Nyamoghanga Mogendi (aged 10) and his brother, Isaac Goti Mogendi (8). Marwa came upon these boys in town and immediately wrote to ask if they could be admitted. Both were suffering from lack of basic necessities; water, food, clothing, and education. They were living with an elderly woman after the death of the father and the disappearance of their mother, both parents refugees from an unknown neighboring country. The boys were brought into Hope Center within 24 hours, bathed, given new clothing (including a school uniform, and their own warm bed. We are happy to have them join our big family, along with the other 15 new orphans we admitted already in 2018. Because the boys are refugees, they are not entitled to any assistance from the Kenyan government. Luckily since we are not receiving any funding from them, we can accept any orphan who is endangered. Just this month, we have taken in 17 small children who were languishing, living off whatever scraps they could find. All are in need of sponsorship. We will be posting the remainder of their photos and stories on our sponsor’s page very soon. Please consider giving one of them a future.